Oil prices dropped another 3% on Wednesday after data showed surprising rise in U.S. crude stockpiles. Oil futures slid to just under $36.50 per barrel after the U.S. Energy Information Administration said U.S. crude inventories rose by 2.6 million barrels last week. That was a lot worse reading than expected. Analysts had predicted crude stockpiles would decline. "At 487.4 million barrels, U.S. crude oil inventories remain near levels not seen for this time of year in at least the last 80 years," the agency said in a statement. 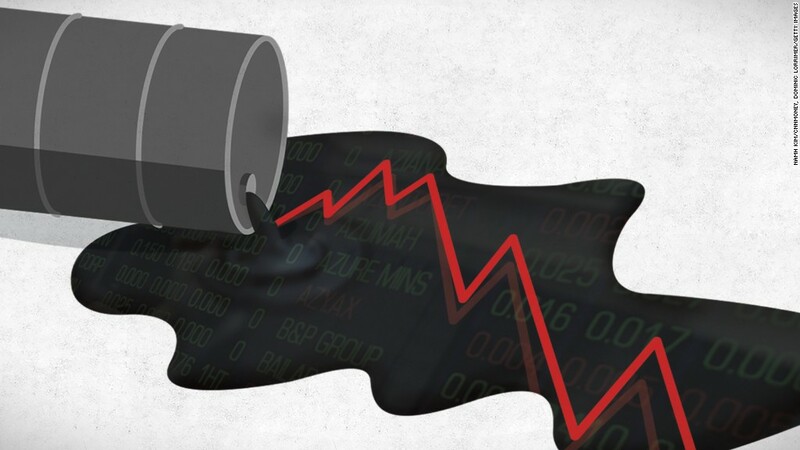 The drop in oil futures prices erased gains from Tuesday and pushed down energy stocks. Oil prices have collapsed 30% so far this year, to levels not seen since the global financial crisis. The global oil glut is rising, as OPEC countries keep pumping record levels of oil in order to defend their market share. Slowing demand from China and other countries are making the situation even worse. The low oil prices are good news for consumers taking advantage of cheap gasoline. But U.S. oil producers are suffering. Their production costs are higher than those of producers in the Middle East, and they are getting squeezed by the collapsing prices. The dramatic drop in oil prices has left the the energy and mining industry reeling from over 100,000 job cuts in the past year.